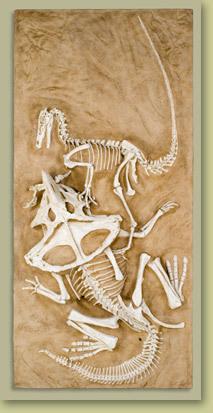 During the Polish-Mongolian paleontological expedition to the Gobi Desert of Mongolia, in 1971, an articulated Velociraptor mongoliensis skeleton was found with hands and feet grasping a Protoceratops andrewsi. Evidence suggests that these two dinosaurs were indeed killed simultaneously, smothered by sand, possibly during a dune collapse. The active predatory nature of velociraptor is graphically illustrated as it grasps its prey with its forelimbs, while kicking and raking the belly and chest with its hindlimbs. Protoceratops was discovered in a semi-erect stance with the Velociraptor’s right forelimb clutched between its jaws in a desperate fight for survival. Their discovery reveals a snapshot in time, of a life and death struggle, between these ancient adversaries. Ideal for an exciting and dramatic stand-alone exhibit, or use it for a unique children's paleo dig. Notes May take approximately two months for delivery. Check with us to see if an earlier delivery is possible.